What's the status of this corner? Black has two separate eyes, but is unable to capture the white stones. I think this is seki, but I'd like somebody to confirm that. If White plays in this position, Black can capture the three white stones and live unconditionally. So, the best White can get from playing is a ko threat. On the other hand, Black can force the position to repeat. Black plays in the corner at the 1-1 point. White is in atari. White captures two. Black is in atari. Black captures one, recreating the original position. So, if Black is losing by less than the value capturing White and living (five points, probably less), Black can play at that 1-1 point to force a drawn or no result game. The outcome depends upon the rule set and how it handles repeating positions. Each repeat costs Black a point, because White is capturing two for each single stone Black captures. 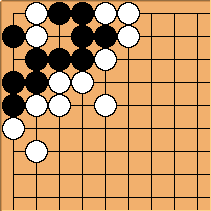 If Black insists on actualy playing that way, wouldn't White just let him have the group after 30 or so repetitions? Oh wait-- I guess you're saying that under area scoring rules Black can make the game last forever? No known area rules in actual use would allow endless repetition by Sending Two, Returning One. It's a seki. Please see the Super Ko page which discusses a position identical to this one in all essentials. Per that page, there are rule sets that disallow this type of repeated board position. Thanks for the responses. I should have looked at the seki page first. The fourth example, seki with a single false eye, covers it quite nicely.